The sun’s heat drastically increases the load on the HVAC system of a building or a factory, in turn increasing the electricity consumption. In its previous article focused at reducing the load on the HVAC system, StitchWorld in its December 2014 issue, highlighted In’flectors which prevent 72% of the sunlight from entering the structure from the windows, which account for 25-35% loss of heat or air-conditioning from an average-sized building. Along the same lines, a significant amount of load can be reduced on the HVAC system by applying a heat insulating coat in form of paint or tiles on the exterior walls and the roof. Companies that are providing these heat insulating solutions claim that these solutions can reflect back up to 95% of the heat, in turn reducing the temperature of the surface of the roof by almost 20° C and bringing about a difference of 5-8° C inside the room. 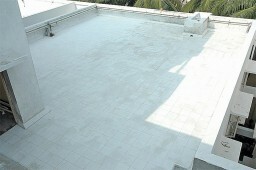 “Under the direct exposure, when the outside temperature is 45° C, the temperature of the ceiling is nothing more than 35° C and of the concrete roof is 70° C, and after applying our solutions the same comes down by 20° C, comfortable enough to walk on the surface with bare feet,” states Sameer Roy of Himani Insulation, dealers of Thermatek’s heat insulating products. The rooms built directly under the roof of the building inflict the highest load on the HVAC system as the ACs run at 18° C. Hence, if such solutions are applied, the air-conditioners would run at a moderate load, consuming significantly less power. “These solutions can also affect the health of a person because if a person comes out in an air-conditioned cabin or room in an open area with a higher temperature, on a regular basis, he/she is bound to fall sick,” highlights Sameer. With summers lasting for almost 9 months in all the apparel manufacturing hubs, direct savings range from 30% to 50% in the electricity bills while the indirect savings are numerous as companies can do away with the air-condition in some areas and scenarios. During winters, it works in the opposite manner, by not letting the heat inside the room move out through the walls or the roof as the building is completely enveloped, thus maintaining the comfortable temperature inside the room. The reduction of temperature inside the building helps in cutting down the power consumption by up to 50%, again because of the reduction in the use of room heaters. The effect of these systems increases with the increase in amount of heat. 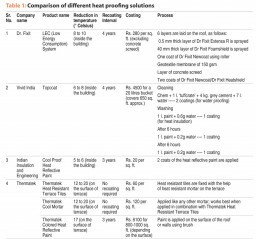 Most of these heat proofing solutions conform to Green building requirements and help in reducing the carbon footprint by saving almost 25-40%. There are a few factors upon which the effectiveness of their product depends. Windows & their opening inside the room – The amount of heat coming inside the room would vary with the openings and glass windows in the room. People inside the room – The net amount of heat produced by the individuals due to exhalation inside the room would increase with the number of individuals inside the room. 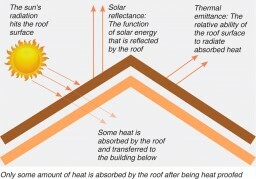 Surface of the roof – The amount of heat conducted through the walls is dependent on their thickness and nature of the materials used in construction. Hence for concrete walls the natural heat insulation would be the maximum, for asbestos it would be a bit lesser and for corrugated GI sheet it would be the least. Air-conditioning – The airconditioning system inside the room would obviously affect the temperature inside. Wind conditions on the surface of the roof – The wind on the surface of the roof drives away the heat on the surface. Heat proofing solutions are available in mainly three types – paint, tiles and mortar. Paints are also of 2 types: first, based on elastomeric coating which does not crack even under rapidly changing climatic conditions, unlike the traditional waterproofing layers which develop cracks easily, allowing water to seep in. 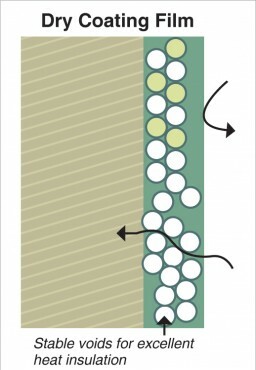 These elastomeric coatings have hollow microspheres which have encapsulated air which helps in heat insulation as it does not allow heat to pass through it and a little amount which does pass is at a slow speed and hence the effect is reduced till the time it reaches the wall, resulting in cooler surfaces. The second type of paint is based on a patented technology which reflects back up to 95% of the heat, once the infrared rays strike its surface. These paints wear off like normal wall paints and need to be recoated after a period of 3-4 years and can be applied on exterior walls as well as all sorts of roofs, except for on smooth plaster, as it does not stay on it. The same can also be applied on prefabricated structures and on water tanks to avoid the water from heating up. The tiles consist of three layers, the top layer reflects the infrared rays, the middle layer emits the heat absorbed and the bottom layer is of mortar, which does not let the heat pass through it. Mortar can be used separately as well, according to the requirement, but works best when applied in combination with the tiles. **This story first appeared on ApparelResources.com here. 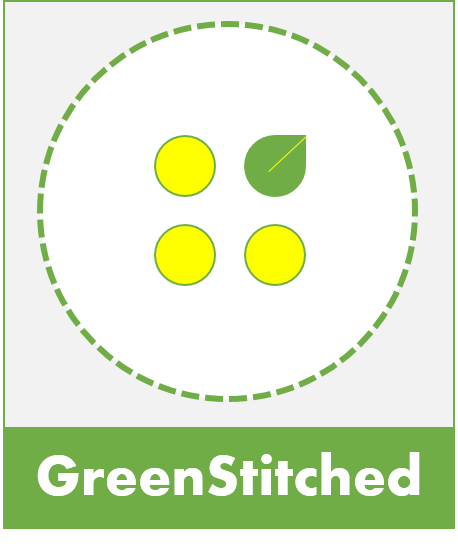 This entry was posted in Manufacturing and tagged Apparel Resources, energy efficiency, StitchWorld.